The Kenmore 665 dishwasher is an under-counter dishwasher that offers several options, such as water inlet openings in the tub wall, overfill protection float, upper and lower spray arms, an ultra flow water tube and a rinse aid dispenser. Available for purchase online and in many home repair stores and appliance stores, the dishwasher is relatively easy to operate. However, if problems with the unit occur, some troubleshooting efforts may be useful in finding and fixing the issue without the need for professional repair assistance. Plug the Kenmore dishwasher into a grounded power supply and check the circuit breaker or fuse if the dishwasher will not turn on. Ensure the door is closed tightly and that "Start" has been selected in order for the wash cycle to start. Allow the wash cycle to finish completely if there is water or detergent remaining in the dishwasher. Do not open the dishwasher door during the wash cycle and wait for the "Clean" light to illuminate after the cycle is complete. Run a rinse cycle if dishes sit in the washer for several days before washing and an odor develops in the unit. Examine the spray arms for possible obstructions if the dishes are not clean when the wash cycle is complete. 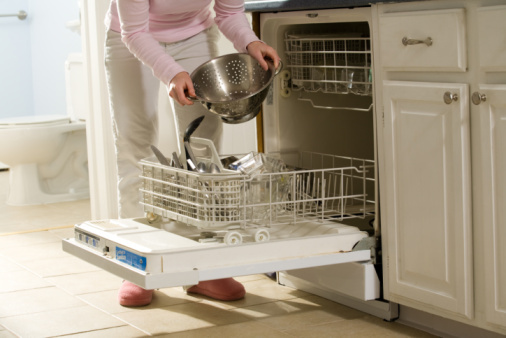 Avoid overloading the dishwasher, as this may block the water jets during use. Fill the detergent container to the fill mark to provide adequate soap for the wash cycle. Wash delicate items, such as fine china or crystal by hand to avoid chipping in the dishwasher. If delicate items are washed in the dishwasher, place them in the top rack only with a few inches of space between each dish and use a gentle wash cycle.